This is a highly unusual, Muhle 4 Piece Shaving Set featuring superb faux horn for the shaving brush and razor handles. Muhle places great significance on superior engineering and on the ergonomically designed properties of its sets, naturally this set is highly pleasing on the eye. This Shaving Set contains a Muhle Pure Badger Hair Shaving Brush, Fusion Razor and a chrome plated Stand with Lathering Bowl. Badger Hair Brush: This fine shaving brush is made using 'Pure Badger Hair'. It's ideal for lathering shaving soaps and creams alike. A badger hair brush will help lift the bristles off your face and soften the bristles prior to shaving. Nothing beats the luxurious feeling of applying lather with a quality badger hair shaving brush. 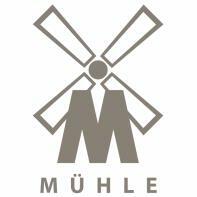 Muhle Fusion Razor: The new generation Gillette Fusion Razor Blades have been designed to create probably the best shave you can get from a cartridge type razor blade. The new Fusion blades are finer and thinner and have an advanced, low resistance coating which leads to a close and comfortable shave with no pulling and tugging of the bristles. Beautifully balanced, beautifully engineered.